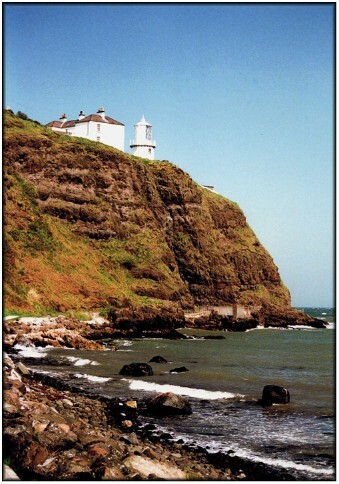 The lighthouse at Blackhead is located on a spectacular clifftop site on the northern side of the entrance to Belfast Lough and a few miles north east of the town of Carrickfergus. The lighthouse is the work of the famous designer William Douglass and dates from 1902. The site is accessible by road from the B150 about two and a half miles north of the village of White Head. Just above the sea and slightly to the right of the lighthouse in the photograph above you can just about make out a concrete walkway. This is a short section of a spectacular coastal path that meanders around the headland here. The path crosses a number of man made causeways, bridges, and walkways and passes through a couple of tunnels - it dates from the Victorian era and is now much shorter than it was originally. But it is still spectacular and makes for an exciting and enjoyable afternoon walk. I heard some time ago that it was to be restored to its former glory but I haven't been able to find any evidence that this was been done. As this was my sole visit to the area I am unable to give any meaningful advice on access to the lighthouse or the opportunities for photography from the top of the cliff.